The advantage of this over cascading WMS is that the middle server does not need to know the targeted server URL in advance, and the client (possibly a handheld) only has to provide the URL and the tile indices (x, y, z). In this example, I’m assuming that the targeted WMS server supports EPSG:4326, which is true in almost all cases. Medieval quarter in Barcelona (Spain). Source: Institut Cartogràfic de Catalunya. A French town called Tours. Source: Geosignal. A German town called Ingolstadt. Source: Bayerische Vermessungsverwaltung. What kind of server and set-up are you using as the middle server in teh example above ? Would you have any more details how the reprojection is done and handed? If parameters of request are not OK, return an image saying “Bad parameters”. End. Compute file name (with full path) of the requested tile in the cache folder. If that file exists (previously requested) then return it. End. 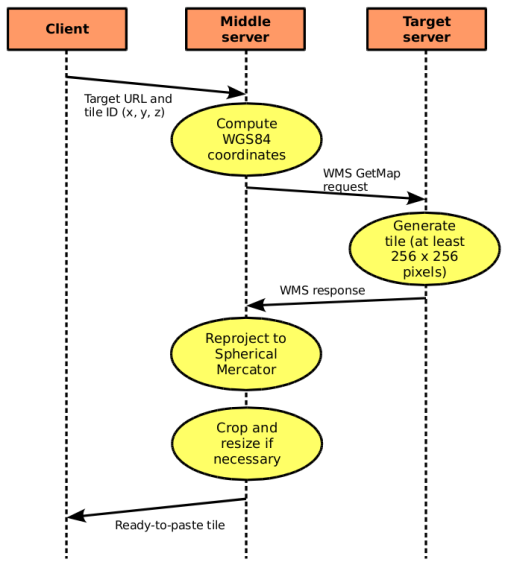 Compute WGS84 coordinates and request the image from the target server (width and height should be at least 256 pixels, so when we reproject it, the quality will be OK). Store the image in a temporary location and create also its WLD file. Write a short script (.sh or .bat) to reproject the temporary image to Spherical Mercator with size = 256 x 256 and clipping the image to the correct bounding box of the requested tile. Run that script, which will use the GDAL utilities, installed in the server. Copy the resulting tile to the right place in the cache folder and return it. End.